I love reading. When I was in school, I spent many a days at a dusty bookshop with lots of books and the owner did not mind my reading half the books sitting on the floor and buying only the few that my pocket money allowed. Later, when I was working and living alone, any miserable day could be transformed by an afternoon spent in a bookshop. I loved browsing through fresh new books which had a special smell. Though bookshop chains didn't come quite as close as one where the owner actually knew about the books in stock, I still loved being in an environment surrounded by books. Off late I have not visited a bookshop and most of my shopping happens through Amazon. The unbelievable prices and convenience of home delivery has have made it top of my favourites list. Last evening we had some friends over for dinner and we started talking about the effect of large chains on small shops which have had to close down. Today, even some of the large chains are under threat from larger online retailers. If this continues, it may not be too far away that all these shops would close and we would move to a totally online model. To me, that is a scary thought. Imagine growing up without have bookshops around you. As a child, bookshops were a special place. They developed my interest in books and are key to my love for reading. While the Disney store and Hamleys are great stores to spend a lot of time, I would hate to deprive children the joys of being in a bookshop. While we worry about the environment, and the state we are leaving it in for future generations, I think we should think about the world without bookshops and what a sad place it would be. So expensive as they may seem, from now on, I'll try and get atleast a few books from my little book shop around the corner. Never use extra virgin olive oil in a cake! And if you are wondering why I even tried. Well, last evening after the cleaning spree, I wanted to bake a cake as a surprise for B. As I was racing against time and got the ingredients together I realised there was no butter or vegetable oil. That left me with two choices, go out buy some butter/oil and not manage to get the cake ready in time or choose between the oil I had at home - Dabur mustard oil (which btw, according to the label here is 'for external use only and not fit for human consumption'!) and Tesco extra virgin olive oil. I figured that the smell of Olive oil would be easier to mask. Well might have been easier than mustard oil, but it definitely was not easy. I poured in half the bottle of vanilla extract ..and there's still quite a distinct smell of oil. The other problem is that being quite a heavy oil, the cake has become pretty dumpy. Well. lesson learnt, next time it'll be quality over speed. 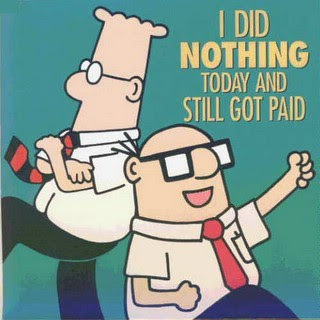 I did nothing today and still got paid ..
As is obvious from a post from home at 6pm .. today was not a particularly hard day! To be fair.. it was not as easy as doing nothing.. (though actually that might be quite difficult) .. but it was quite relaxed. I needed to wrap up a report .. do my work plans and that was pretty much it. I start on something new from Monday .. so it was like my day off. And the Fridays at the out-of-town office is always fun since it is dress down day. After all a day in jeans and sneakers can never be bad! So am home at a ridiculously early hour with nothing to do on a Friday evening (three years back this would kick me into depression thinking I have no social life).. anyways ..so I plan to tidy the house. Have put a nice (hopefully nice) white wine into the fridge .. and shall spend a relaxed evening chatting with B and maybe watching a DVD. Just the thought makes me feel so old though.. oh well ..tomorrow we're going for a house party.. I suppose I'll make up then by drinking and dancing all night. This evening I submitted my first entirely-done-on-my-own report at work. Since I joined I've been working on bits and pieces from other people's projects .. and this one also started the same way. Someone was going on leave and I was to take over and put in the finishing touches. But when I sat to review it with my boss a few weeks back, he wanted it re-done from scratch. In the last couple of weeks I've gone through three outlines and two drafts before submitting the official version 1. The approach my boss uses is very different from anything I've worked on before. Its fairly efficient and has enough checks to hopefully have minimal revisions on the final draft, but the process itself it sooo tedious. Perhaps being my first time he made it more controlled so that I don't show up with my cr*p a month later. Its been very interesting for me since I have learnt a lot about the industry and the company in the process. I've also interacted with lots of people around the organization to get relevant information needed for my analysis. In the process I have realised how there seemd to be so many people doing very similar things. .yet it is so difficult to get the information I need. To get one number I once actually spoke to 10 people. .its so bureaucratic! The other problem was that being my first project I obviously want to make a good impression. I once again (its an old habit) spent too much time researching some things and trying to get the perfect answer, rather that use the trade-off effectively between quality and speed. After all having it all worked out after the event is over is not too smart. Worse perhaps is the amount of time and care I spent formatting. .but then again ..shallow as it may sound..packaging matters. Well, tomorrow when I get feedback I'll know if I messed up or it went well. Its all important since the mid-year review is coming up. At any rate, tonight I get to sleep well .. for all I know tomorrow night I'll be up all night doing the re-works. Today at lunch a colleague asked me how long I've been in the UK and it struck me that we've completed on full year here. Seems landmark in some way .. marking the survival of one year in the 'big city'. The year has been in two nearly equal parts. The first six months of job search angst and the next six flying by. While the first half had its predominant low.. there were the positives. I discovered the wonderful world of blogging. Discovering lots of interesting people in blogworld..and getting great tips (I have bought all my India trip tickets from an agent I read about on someone's blog). There's no way I could have done this now. Getting time of a weekday morning to go out and having fun with the camera. Getting to catch up on reading (though actually with a 4 hours of commuting, I get to read more now). I also realised while a good job was very important to me, there were other things more important. I also got a lot of time to explore the city, make my ten trips around to decorate the house and meet lots of strange people in the process of looking for a job! Not that I would wish for that time again, but hey, I've always cribbed about the job search period, so am trying to be positive for a change! The second half has been hectic, hectic, hectic. Work catching up, lots of guests, finally being relaxed enough to holiday - its all just whizzed past. Sometimes, I just want to hit the pause button for a day. Though ask me even in the middle of my sleep, I much prefer this. I still miss not having close friends in London..it scares me sometimes to think that I may have forgotten how to forge deep bonds..but time will tell. The century refers to this being the hundredth post in my blog. Its been fun writing, sharing things with all of you.. reading about your lives. Sentimental speech ends here before this becomes a mushy pink marshmallow! Is it June already? Where did May go? With so many guests all through the last two months.. its been a lot of fun ..and also very very hectic. April and May are just a haze! For once, it feels good to be home alone. In the last couple of months, our London friends haven't been met, bills have been left till the last minute, the house cleaned to minimal standards (and now a huge mess!) and in all.. fairly chaotic. Now that I am fairly settled at work, that too has been getting hectic. It was also a month of two bank holidays and trips outside London. They should shift one the bank holidays to the next month. That way the breaks get nicely spread out. It is depressing to think that the next long weekend is in August. Since March the only film I have watched is Taxi ..that too on a DVD. I am craving for the big screen. Taxi, btw, is a 'must watch'.. it kept us in splits for the entire 86 minutes. Now waiting to watch Taxi 2, though heard that's not as funny. Read a lovely book - Half of a Yellow Sun. Its written in an interesting style, but what kept me totally hooked was reading about Biafra. I had never read about Biafra earlier and nor about life in a war torn zone. It was all very eye-opening (for lack of a better word).. and a highly recommended book. We also watched Billy Elliot. It was a fairly last minute plan since a friend visiting London wanted to go for it. Given its popularity we got very average seats. I would interested in the opinions of someone who has watched it. Given the hype about awards and comparisons with Wicked, we had very high expectations which sadly it did not live up to. It was very good in parts.. but overall did not have either the music or singing which you would like to hear over and over again. It some interesting sets and a few good dances .. but overall was a little disappointing. Amongst the low points of the month, we had some very avoidable histrionics amongst a group of friends staying with us. I thought we had left these things back in school and was absolutely hopeless at dealing with it. It ended in totally ruining one persons holiday and was a big dampener for the rest. An absolutely miserable end to the month. So that was May in bullet points. I could not think of any other way to join together so many random thoughts. Hope all of you had a good month too.